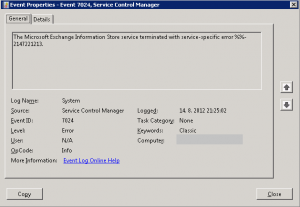 The Microsoft Exchange Information Store service terminated unexpectedly. Unable to initialize the Information Store service because the clocks on the client and server are skewed. After couple minutes of looking into events I found events saying about time synchronization with domain controller. Difference before synchronization was 7 minutes. When I restarted service Microsoft Exchange Active Directory Topology Service all databases mounted correctly. Exchange mailbox server is virtual machine (VM) in VMWare. And that was a problem. When VM is starting it gets time from ESX server on which VM is running. And that was a problem. ESX server had bad time set. 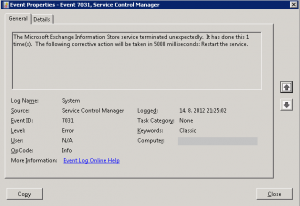 When mailbox Exchange server was starting it aquired bad time from ESX server. VM begun starting services and also Exchange services. Then mentioned services couldn’t start because of time difference between DC and VM. After couple minutes clock got synchronized from DC, but Exchange services didn’t notice that. This problem was caused probably by forcing Kerberos ticket time difference by default to 5 minutes.